After my friend, an iTunes expert, told me this story, it made me realize that many iTunes users not only don’t realize how powerful the program’s contextual menu is, but also may not even know it’s there. Since Mac users are less accustomed to contextual menus than Windows users, many don’t even know these menus exist. Here are 10 things you can do quickly and easily from the contextual menu. If you select a track, you can start the Genius from the contextual menu; just choose Start Genius, and iTunes will create a new Genius playlist of songs in your iTunes library based on the selected track. As you flip through your library, you may want to add some songs to iTunes DJ for a party, or just for your day’s listening. You can do this by dragging them onto the iTunes DJ entry in the iTunes sidebar, but you can also do so from the contextual menu. The Add To iTunes DJ item adds the selected track(s) at the end of the iTunes DJ list; Play Next In iTunes DJ puts the selected track(s) at the top of the list and starts playing the first one right away. If you choose the Get Info item, iTunes will display the Info window for the selected track(s). (Although truth be told, I find it actually quicker to just press Command-I to bring up the Info window.) From there, you can use keyboard shortcuts—see “10 essential iTunes keyboard shortcuts”—to move around the various tabs. If you choose the Rating menu item, you’ll see a sub-menu listing None, then from one to five stars. Set a rating by choosing the right number of stars from this sub-menu. Note that if you use half-star ratings, thanks to a script such as Doug Adams’ Assign Half-Star Ratings, you won’t see those as options in the Rating menu. Do you want to see the actual file for anything in your iTunes library? Choose Show In Finder and a Finder window pops open with the item selected. If you don’t have artwork for the currently selected track(s), choose the Get Album Artwork menu item to tell iTunes to check on the iTunes Store for artwork. If Apple doesn’t sell that music, or your tags don’t match those in the iTunes Store, it might not find artwork. For more of dealing with album art, see our recent article, “Spiffy up your music with album artwork”. iTunes records the number of times you play each track. We’ve written about how you can use play counts (or plays) in smart playlists. Select one or more tracks, then choose Reset Plays from the contextual menu to zero out the play counts of those tracks. Select one or more tracks then, from the contextual menu, choose Add To Playlist. This leads to a sub-menu showing all your playlists (normal playlists only, not smart playlists). 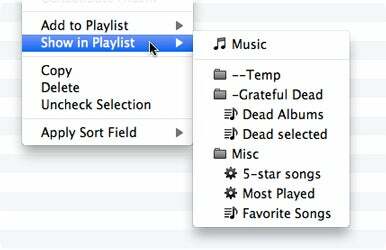 Choose a playlist, and iTunes will add the selected track(s) to the end of that playlist. There’s more in the contextual menu, but I’ll leave that to you to explore. iTunes’ help covers some of the other items in this menu. Remember, it is contextual; I’ve looked at what displays when you select music tracks; for other types of media, different menu items may display, though music files offer the most options.